A story in the Capital Times has been intriguing us here at Eye of the Fish world headquarters, and I’m surprised no one else has picked it up. The Cap Times (with a nicely renovated website – good work guys!) interviews a “local businessman” who is unhappy with the Council spending over a million bucks on ripping apart the old Cobblestone Park outside the big red building of Arch and Design. The man, who owns a business nearby, wrote back highlighting his concerns. He never received a reply… He says it�s not appropriate to spend such a large amount in the current economic climate on something of �low priority�. �I like parks, but instead of doing up this one, the money could easily have been used to provide more parks by buying some of the little properties which are coming up for sale, putting some trees on and enhancing the city rather as they do in London� he says. The photo in the article is clearly taken from a local business, the nearby Comfort Hotel – developed by Rex Nichols, the husband of the Mayor. It couldn’t be as simple as that could it? Is the “local business man” actually the mayor’s other half? We’ve spoken briefly about parks before, including discussions on the crappy little pocket parks of Karo Drive and also a proposed park on the Swan Lane carpark site. Wellington urgently needs more parks in the inner city – spaces that the growing number of inner city residents can get away from cars, whether they are moving or parked. Spending the money on this Cobblestone revamp seems a complete waste of time, although I’m sure we’ll all enjoy it more when it is complete. But again, like the (hideous) revamp of Glover Park, the main aim seems to have been the deletion of the “undesirable” types who normally inhabit the park. This includes birds (of both the feathered and transvestite species) as well as winos (includes beer swillers, glue, meths, and petrol sniffers also). The starlings have had their favourite tree turned into firewood, the squealing trannies and hookers have had their ‘play-station’ (derelict bus shelter) removed, and the boozy bozos have been walled out by a tall timber fence (back to Glover Park for a few months then boys?). The ‘pond’ that was the main feature of the site has been demolished (well, seeing as no one could be arsed filling it with water for the last 4 years, that seemed to be a foregone conclusion). There are more important things to be doing than fiddling about with parks and winos. A far more important project to be getting on with would be the Memorial Park up on Buckle St, where the Council and Transit / NZTA are still arguing over what should be done. Latest rumour is that we may hear more in early 2010 although the NZTA are appalling at discussing things with locals and so who knows what to expect. One simple suggestion from the Fish however: while you’re all arguing over the route and how not to poison the children in Mt Cook School, how about just commissioning a summer archaeological dig on the currently fenced off site, so that you can get that bit out of the way? – Point to note here. The ponds have been left empty for the exact same reason i belive the park is now being re-done. The previously mentioned “winos” – or more specifically the very real fear that said inebreated person will fall and drown in the water. This is the actual resaon the water was REMOVED not forgotton. Also you seem to pine for the loss of such inhabitants. Hmmm well I will not – on behalf of every past current and future occupant of the Architecture + design school who work to midnight and beyond and (untill recent changes to access) would often walk out at 2 – 3 or even 4 in the morning (or just sleep inside ). Student and guests to the hotel Do not enjoy early morning meetings with the intoxicated, in the dirty park in wellingtons (all be it small) redlight district. The changes to this park you listed above are positive – every one. The create a park that is safe friendly and actaully USEABLE. If you pine for the loss of its late night residents invite them over to sleep on your front yard – i am sure you can spare the news paper. If the “very real fear that said inebreated person will fall and drown in the water” is indeed the real reason the water disappeared, then we live in a sadly pathetic nanny state indeed. I would have thought that falling into a pond of cold water would give said winos a good sobering wake up, rather than lull them into an endless sleep. Personally, I think that someone just left the plug out. There is, or should be, a greater issue at play here. Gambit very rightly points out that the “said inebreated person[s]” are annoying and “intoxicated, in the dirty park” … but his/her solution is that these”late night residents” should be moved on. Aside from the very obvious question “Where to?” (obviously not Island Bay any more), and the loss of the unused bus stop which served well as both a rainy weather shelter and a back-lit advertising hoarding for the whores, there is the question of why the”past current and future occupant of the Architecture + design school who work to midnight and beyond” should have any greater right to the park than those that have nowhere else to sleep? – Even if the renovation seems a bit over the top, and a brand new park in a different part of Te Aro might seem worthwhile, really, how far is $1m going to go in buying property? Even in a depressed market, that’s unlikely to get you anything like the size of Cobblestone Park, and won’t leave you anything over for landscaping. – The direct line to the entrance of the hotel might seem suspicious to those with a conspiracy theory bent, but consider that (a) the hotel entrance does actually provide a useful shortcut to Cuba St, (b) it also leads to the through link to Wigan St and (c) it ends up close to the main entrance to the A+D school. Whereas a direct line in the other direction would lead you halfway down Knigges Ave to … well, not much of anything really. 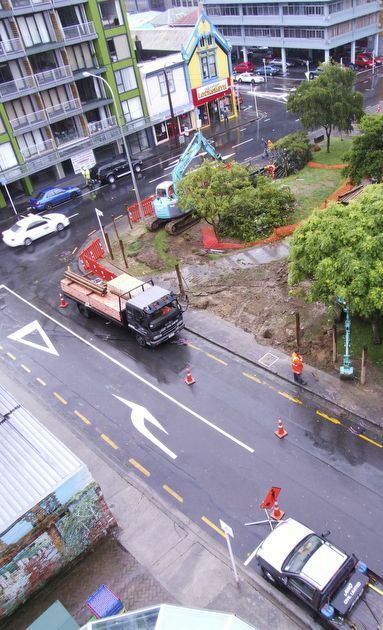 – “the Memorial Park up on Buckle St, where the Council and Transit / NZTA are still arguing”: isn’t Memorial Park primarily driven by Central Government? If MCH aren’t going to make a decision & stump up with the money, then no amount of agreement between COuncil & NZTA is going to get things going. I agree with the local business, the anonymous Maximus and the Commie Pinko Liberal. What a waste of $. $1 million will just mean a half-baked design in an area (next to noise-y, pollution-y, dangerous SH1) with limited park potential – so why the “pimp-my-park” obsession? It seems like, having given up on their internal urban design advice, the council’s new open space policy is to simply follow the homeless around the city – redesigning their pick of hangouts. Brilliant! A million? Coulda dunnit for half that guv, and still some left over for a pint or two. Seriously, I think Parklife has a good point about the whole ‘shortcut’, even if it does lend itself well to the conspiracy theorists. As for the rest of you: over-zealous architecture students have as much right to feel safe at night as the rest of us, so getting rid of winos (and to a lesser extent, the trannies,(although they are a hoot)) is fine with me. If they want another dangerous playground – replacing the empty paddling pool with a busy highway – to park themselves (no pun intended), why not the Karo Drive park? Hey, they might even get high off the fumes – bonus for them! Speaking of the Karo Dr park, does anyone question why they didn’t put up any low/low-medium height screening vegetation to take the edge off the the adjecent road? Big mistake from my point of view. But then again, if all the Council does is keep doing up the same parks over and over, then we’ll never get any more parks. Council spent over a million (or was it $2m?) doing up Glover Park, around a mill for this Cobblestone Park, quite a large amount on the corner of Courtenay, all of which are arguably non essential works and the money could have been used to buy up Swan Lane car park and banning cars from it. Just think: being able to sit in fine establishments like Duke Carvell and sipping pinot whilst being on the edge of a pedestrian area, rather than having a sea of glinting metal sculptures sitting there, occasionally farting into life. Come on Parky, you know that we need to get more parks for the peeps. Who’s that gut lord marching? You should cut down on your parklife mate, get some exercise! Completely agree, Max old boy, that it would be better to just give it a bit of a spring clean and put aside the rest of the money towards new parks (or other public spaces) in the future. But the key word is “towards”, and the Anon Businessperson’s suggestion that “the money could easily have been used to provide more parks by buying some of the little properties which are coming up for sale, putting some trees on and enhancing the city” implies that the council could actually have got something useful for the paltry million or so. And while, as I say, I’m not in the inner-city property market, I’d wager that a million bucks would get you approximately sod all. “I have just read the article on the Cobblestone Park revamp in the latest Capital Times. “the local area human trash � hookers and drunks and druggies” oooh, that’s not going to do much for your Customer Liason. We did think about whether or not to proceed with Cobblestone Park. The key reason for upgrading it is that – as several people have said – we don’t have many parks in the inner city. Therefore it is really important that the ones we do have work well. Cobblestone Park didn’t. Incidentally the reason the pool wasn’t filled was because it and leaked and apparently wasn’t worth fixing just from a maintenance point of view. I agree that over time we should be adding to the number of parks in the parts of the central city where they are currently lacking. Memorial Park is a good opportunity, which I hope will all come together sooner rather than later! However at least one or two more on the Aro Flat would be desirable as more and more people live in the central city. The Mayor has consistently abstained from participating in any discussion related to Cobblestone Park. The revamp was subject to a design competiton. 4 leading consortia participated in that process, were interviewed and their proposals thoroughly critiqued by a panel including a leading external landscape architect and architect. 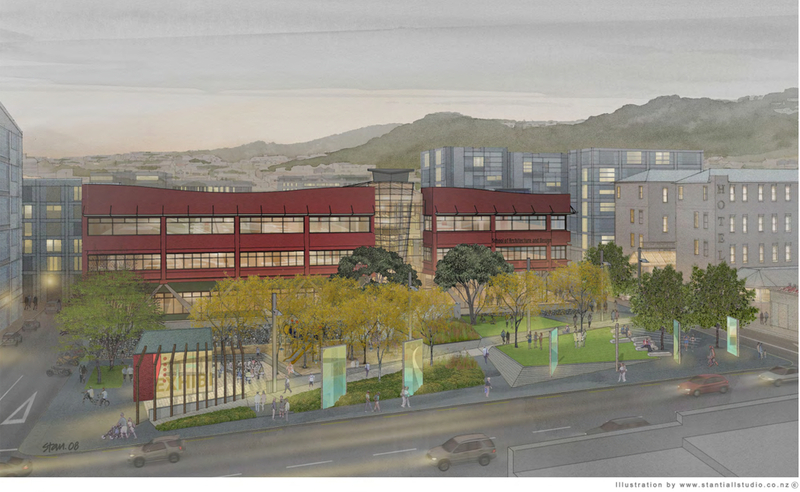 The disappointment with Cobblestone Park is that the University was contemplating opening out the front of their building onto the park, including a cafe. That isn’t happening at least for the moment. I hope that the University reconsiders that because it would obviously be a further major improvement. Always happy to discuss further. Councillor Foster, thanks for the message – appreciated – and good to have some informed feedback. Yes, you’re right that the University should open out more onto the park – not sure how they can be forced to do that though – although perhaps with the upgrade there will be more interaction than there was before. I think the Arch School use it informally already, but its too shallow to really work as a destination park for many people – and will be even more so now, with less planting and more paving. The students seem to like to mostly sit on the grassy mounds in the sun, while the winos hang out under the trees. Good to hear that the Council is still keen to add to the number of Parks in the city – grossly under-parked at present – don’t forget my nomination of Swan Lane as best site! The Council needs to look at picking the site, rather than accepting left-over scraps of land – like we have said here at the Fish, the land on the sides of the Karo Drive are useless as parks really, and will rarely if ever be used as a destination in themselves. Glover Park will never really work well, unless and until it gets a pedestrian through flow – this just isn’t going to happen. There have been extensive studies of open space, and the popularity of parks is highly dependent on a number of things, including sunshine, active edges, shelter from wind and passing cars, but also massively on natural alignment with pedestrian routes. Looking forward to Memorial Park! Good points all Maximus about what makes a park work. We absolutely do need to get the right locations. I think Swan Lane as been looked at several times. The Wellington 2040 (thinking about the shape of the Central City over the next 30 years, and how we want it to evolve) consultation which has just completed its first stage should provide some very useful feedback on this too. We’ll keep in touch on this topic too.